I had been to Portugal before and loved it. I always saw it as the younger brother to Spain. A slightly scruffier and more swiftly rustic brother who was into graffiti but was undoubtably brilliant, knew more about the world and spoke better English. Similar but different. This time we entered from the south, over the broad bridge leaving behind the flat marshes and lonely beaches of Huelva to make the first stop at Cacela Velha. We had arrived in the morning and completely forgotten the arbitrary need to put our clocks back an hour. The tiny hillock-topped village, with its far-reaching Atlantic views, was the first sleepy look at the Algarve region. The hamlet was a cluster of no more than perhaps twenty houses, three or four eateries, and a church. The place was silent but for the noise of one bar slowly putting out tables and chairs in the morning heat. The walls were blisteringly white and framed in Wedgewood-blue tones and topped with light-brown tiles. A dash of yellow here from a doorframe and splodge of red there from tree-flowers, added a sort of postcard peculiarity to a dormant settlement that presumably filled up at summer lunchtimes. 1901 tour guide writers weren’t to know that in the 60s the Algarve would become synonymous with package low-cost beach tourism and tacky resorts populated by fish and chips and deep-fried English people. The outlying road, running parallel, but a few kilometres off from, the sea, leapfrogged generic villages through scruffy and dry land. It was the home of southern sun, but not much natural wonder. The Algarve, perhaps sensing our blasé thoughts, started to show off a little and offered Tavira, a place with barely a mention in the century’s old guide. But if there was one common word in the English language that could distill riverside white-walled Tavira down to its inherent truth, it would be ‘lovely’. It was just completely lovely. The house and cafe-lined waters of the Gilão added a chalk-white Venetian flair to the small town. Those glowing buildings rose steeply but swiftly in a huddle of tiles to a small peak capped by a clean little church and the garden-filled remains of the medieval castle. The tourists cluttered about each other over the ramparts - a mess of sun-visors and pink Dutch and British skin. Lunch was had at charming little O Manel, over the river away from the great wash of tourist fare. Ever the hypocrite - though I like to proclaim traveller over tourist - I was the visitor who hated being near other visitors. 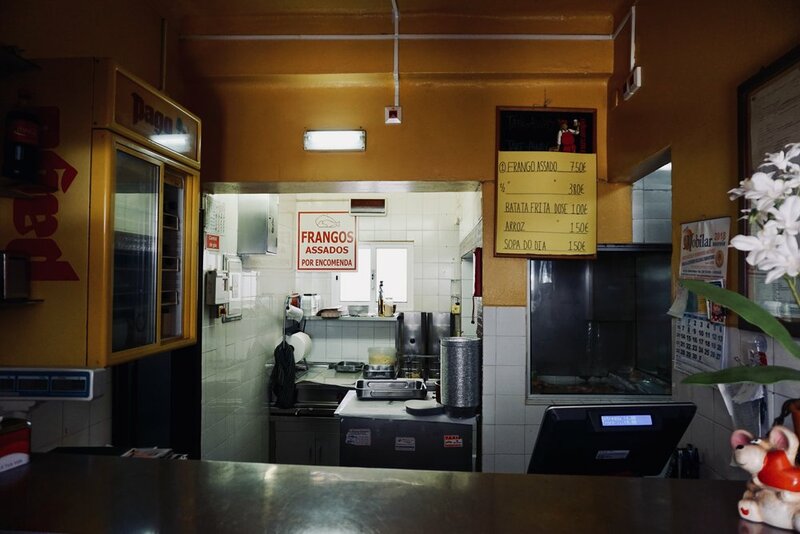 I had found a little blog entry by a Portuguese guy who claimed that down a side-street and covered in yellow flowers, O Manel was the place to go for chicken. First of all, and also a quick tip/warning, in Portugal they often put out nibbles prior to ordering. If you decide to eat them you do pay for them. Often cheese, olives, spreads and bread. 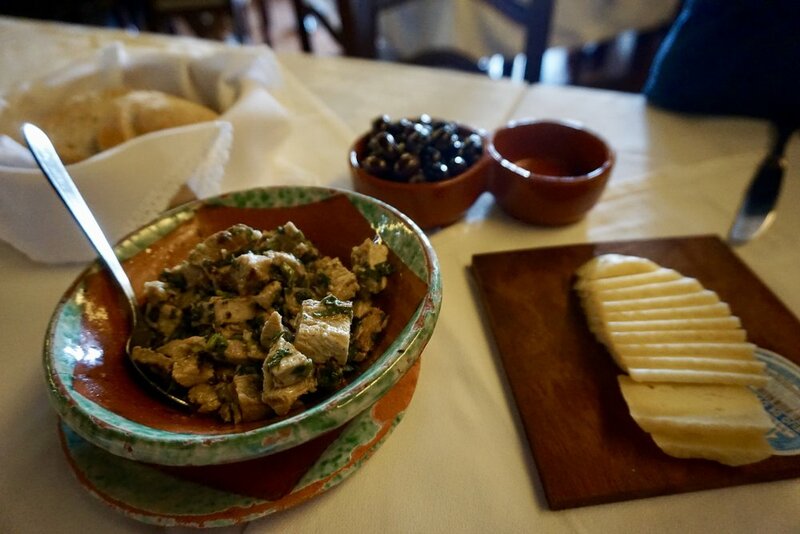 We buckled at Tavira because of both hunger and the desire to, instead of ordering starters, enjoy a small wheel of local sheep’s cheese and a homemade crab pâté. Then the star dish, the frango assado - roast chickens, broiled on spits in the little aluminium bar inside - served piri piri style. In the UK, ‘piri piri chicken’ is synonymous with a certain franchise restaurant. Here it was in its original form: a lovely spiced sauce of herb/chilli/citrus in which the chickens are basted. The result was juicy poultry and a nice warm spice to make the nose run. Served with a bottle of Arinto (grape) white from Adega de Borba, the loveliness of our first foray into Portugal was a good one. The coast of the Algarve proper then arrived and, despite the lack of desire to sit on a beach for any discernible time, it would have been remiss of us not to at least glimpse the azure. Tiny capillary roads would constantly filter off the main artery and lead seaward. We chose one that would head to a famous view and equally famous strip of sand. The Praia da Marinha had one of the vistas that allowed the Portuguese tourist board to collect northern Europeans there to spend their money year in, year out. Arches, stacks, Caribbean waters. I’ll let the photo do the talking. The next stop was Silves, one of the clear highlights of the Algarve. A flurry of colourful streets and overactive vegetation acted as a counterpoint to Tavira. It swept up the side of a bluff and was topped with a very impressive castle that reminded me of the walls of the Alhambra. That was good enough for us. The orange juice, unsurprisingly, tasted of orange juice. But the cake…the cake was quite something. Deceptively moist and bursting with a fresh orange taste, offset with the side flavours of sweet sponge cake and almonds. Full of cake and vitamin C, I then proceeded to pop out my knee while trying to take a photo of a church. I slid on a sandy bank and my knee squelched and pinged. I hobbled back to the car, popped a lot of pills and breathed heavily and enjoyed the constant threat of vomiting all the way through the drab central lands to grand old Lisbon. The first night we ate locally. We were tired from a day in the Algarve heat. That, and my knee felt like somebody was jabbing a hot needle under the cap with every step. I did my usual internet work - what a godsend it is for travellers - and found a local-looking place nearby. We hobbled in to big smiles and warm greetings, wooden tables covered in simple tablecloths, and zero glamour. Perfect. For my dad came a steak with small roasted potatoes; the Portuguese are sadly not famous for their steak, but should be. 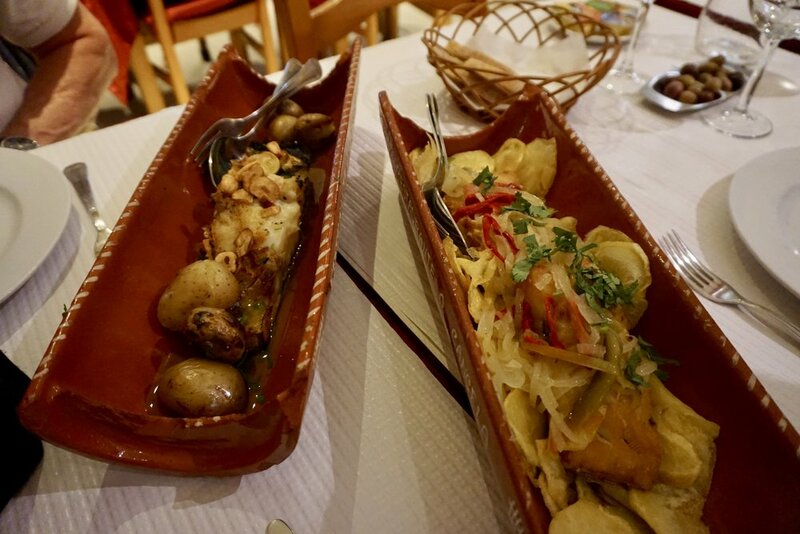 My mother and I indulged in two types of cod served on tiles: bacalhau a lagareiro (cod roasted with lots of garlic and some small potatoes) and bacalhau à minhota (baked with red peppers and onions). To drink we opted for a bottle of Quinta do Vallado red from the Douro region. For the warmth and vibe of the restaurant, this was a tavern which quickly filled the top spot. Up at the top of the Alfama neighbourhood, the visitor can follow the hordes to the underwhelming castle with its impressive views and shed as much sweat as desired. The top here is a cluster of postcard shops and trappy bars, though there was one modern shining little light. Sitting surreptitiously on a road making its way back downhill is a small, friendly, brightly-coloured petiscaria. Miss Can is a project of a mysterious woman who is the daughter of a Varina - a fisherman’s wife who sells fish. In lieu of selling fancy tinned goods from canneries, the secretive owner has brought a selection of conserved goodies to the public in the form of a tiny little bar. 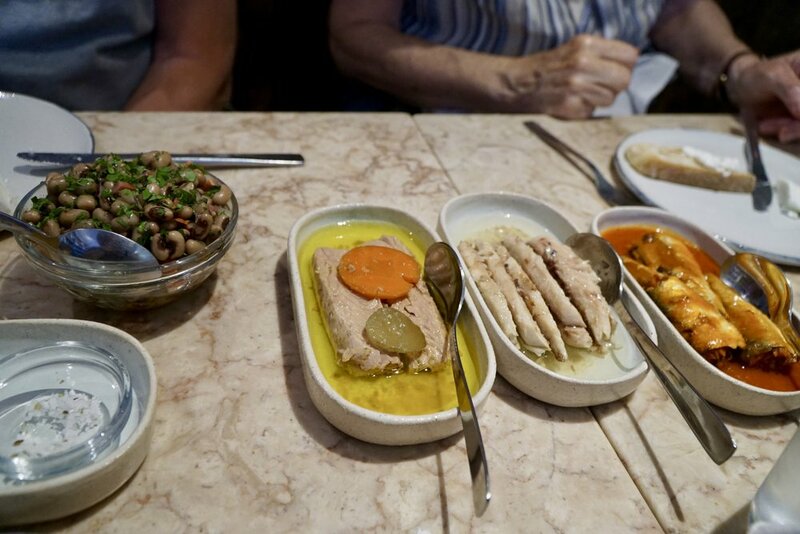 We ordered a few latas - sardines in a tomato sauce, tuna in a spicy pickle and mackerel in olive oil. They were served with crusty bread and glasses of own-brand local wine. Also a little freshly prepared cold salad of black eyed beans, onions, chorizo and parsley. We took the ‘free’ cheese to begin with as well. Always take the cheese! BA Wine Bar - Tábua de queijo, charcutaria e azeites. Vino! For me to indulge my love of wine, I was allowed to take us to BA Wine Bar up in the scruffy yet charm-filled cobbled mess of the Bairro Alto; the upper neighbourhood that looks like the Lavapiés area of Madrid had a baby with Naples’ Spanish Quarter. The way the bar works is that they come up and ask you a price range - ‘4 euros to 9 euros a glass’, for example - and then individually they ask what kind of wines you like or would like to try: ‘I like big powerful reds’, ‘I like weird regions and experiments’, ‘I like fruity whites’. They then go off and do their homework, coming back with two or three options for you sample and choose the one to be your full glass. The menu is mostly cured products and tinned goods; I believe they have no real kitchen. We opted for a vast platter of different cheeses and meats, accompanying oils and sauces, and fresh bread. An obligatory stop had to be made at this 181-year-old bakery/cafe. 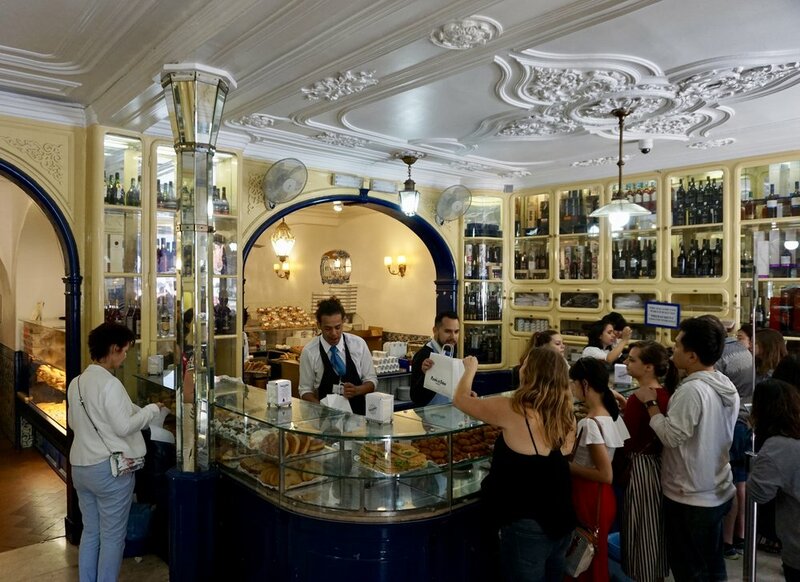 At the very popular and, to me, utterly unappealing tourist-filled mess of the Time Out Market - like Madrid’s San Miguel but on steroids - we caught a local bus down to the Belém neighbourhood: famous for explorers, monuments and pastries. Egg custard tart pastries to be precise. I ordered three pastries and coffees and waited. Despite the hordes, it was an undeniably attractive old thing. Waiters in blue ties, aprons and white shirts rushed about. At the front there were hanging lamps, generously-lit blue and cream hued stylings and everywhere you looked was either wine bottles or mountains of the little cream tarts. They arrived and we dusted them, as per tradition, with a bit of cinnamon. Quite frankly they were perfect and the hype and history of this secret recipe is deserved. The crunch on the pastry impressed me more than anything, and that flaky crack was followed by the sweet cream filling. Perished in three bites. Should have ordered more. I wanted to go somewhere super rustic, somewhere where the food was served on steel platters and the menu handed to you on a piece of paper and where English wasn’t going to help you. I speak Spanish and French and can therefore get by in Portuguese with a little help from a dictionary. Such a place was Popular do Capelo in the Chiado neighbourhood - ostensibly a place of smart shops and handsome buildings. I don’t think a bar could be more unassuming if it tried: a peeling yellow building and one dark doorway with a black awning bearing the name. Inside reminded of those tascas, those rustic bars in Spain where people are coming in from work, so they eat at the bar, or at tables with paper tablecloths that can be constantly replaced with every new customer, and where cheap wine is served in glass jars. 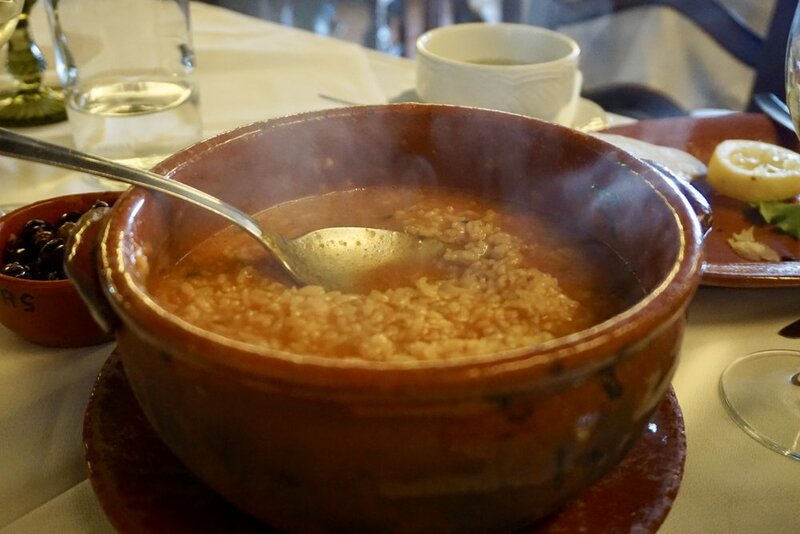 We ordered a prato do dia - dish of the day - which came plonked down with a small smile that appeared when the waiter realised he wouldn’t have to use another language. My dish was bife á mostarda - some thin steaks covered in a luminous and liquid mustard sauce and topped with a fried egg. It looked absurd but tasted actually rather nice. My mother went for costelas de vitela - stewed calf ribs - served with a strange herby salad, whose name I forgot to document, chips and a slice of orange. It could have been a little hotter in temperature, but the flavour was pretty good. Our final meal, and excuse to celebrate my birthday, was had at the far-flung and scenically located restaurant Ponto Final in the Almada district, across the Tagus and reached by ferry. One then had to walk along the very pretty but blustery promenade. The restaurant looms out from its chair and table-covered jetty position, white and grey and lined with yellow paint. We most certainly approved the move to attack the table-top-tapas before ordering our mains. A delicious warm and herbal pork salad, the ubiquitous cheese and some very promising olives. And bread. In Iberia, always bread. 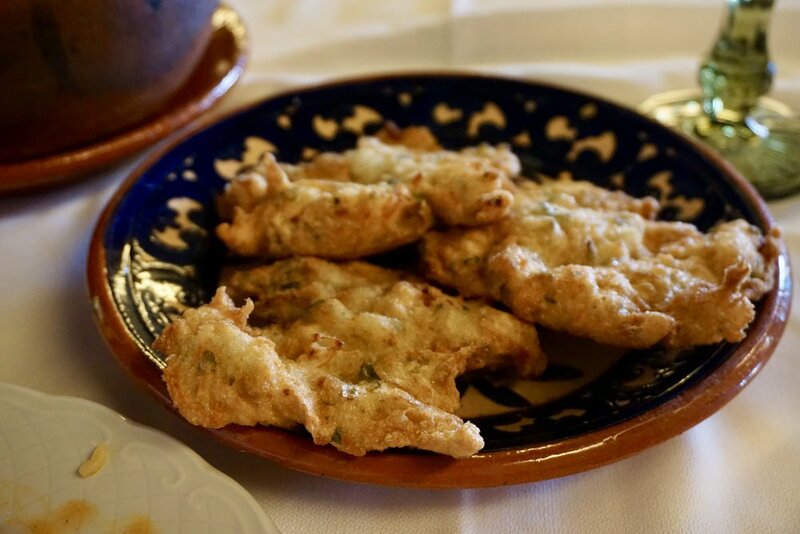 I opted for the mouthful carapauzinhos com arroz de tomate, which turned out to be little floured and fried horse mackerel that put in mind Spain’s boquerones. They were served with a slice of lemon and a vast bubbling cauldron of tomatoey rice. It was a combination that I didn’t really understand, but I wasn’t about to complain. My mother had a lovely big sea bass, cooked simply in the oven, whereas my dad went for another Portuguese under-the-radar dish: pataniscas de bacalhau, sturdy little cod fritters again served, quite bizarrely, with another vast rice cauldron, this time with kidney beans and a slight Wild West flavour. The food was above average if not mind blowing though, to be honest, might have been slightly compromised by our large lunch at Popular do Capelo. 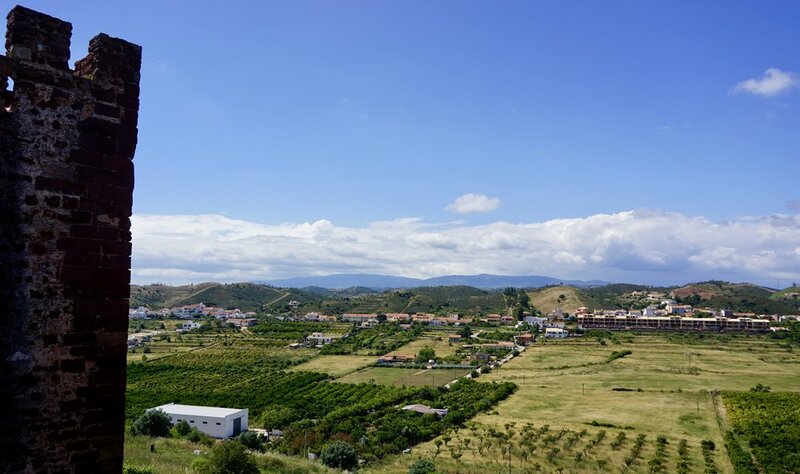 I would definitely return though, if not for the calm beauty of the location, the good food, and the bottle of Periquita from José Maria da Fonseca to go with it all. As we headed out of Portugal back to Spain we took a few minutes to relax in one of the country’s most remote areas: the Beiras. We stopped at the outrageously cute and granitic hilltop village of Monsanto and took stock of the food. Again, like Spain, similar but different. 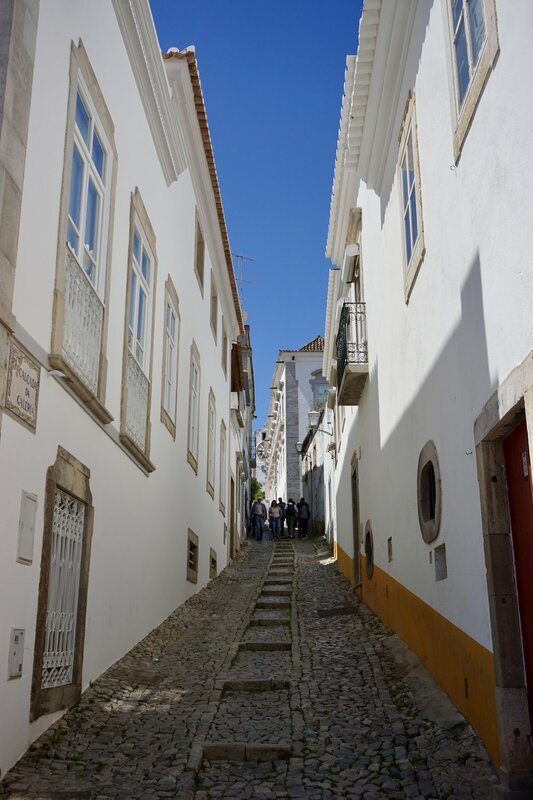 And above all, there’s more to Portuguese life that custard tarts and cod.